Competition: WIN! A Pair Of Lionel Messi’s Super Swish Gold AdiZero F50 Boots! It’s competition time here again on Pies folks, and this prize is going to take some beating! The customised adizero F50 boots have been produced in a celebratory gold colourway and feature the flag of Argentina, the years of Leo’s Ballon d’Or successes and a thank you message to his fans. 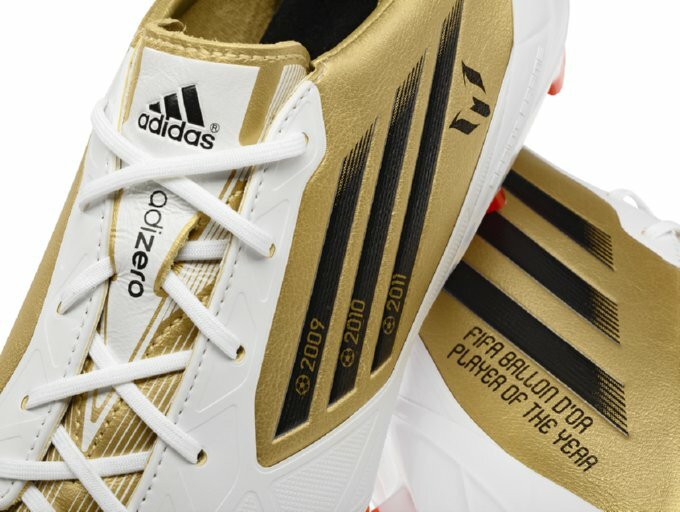 To celebrate Leo’s big win, Pies has teamed up with Adidas to give away a pair of these shuper shexy gold adizero F50 boots to five – count ’em, FIVE lucky winners. Q: Which Argentina coach gave Leo Messi his full international debut? Five correct answers will be chosen at random after the competition closes at midnight (GMT) on Monday 16th January. T&Cs: Competition is open to Pies readers worldwide. One entry per person. Five winners will be picked at random (by me) once the competition closes.